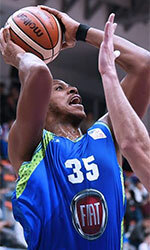 Jean D'Arc Vichy Clermont Metropole (ProB) strengthened their roster with addition of 25-year old Cameroonian international forward Arnaud-William Adala Moto (198-111kg-93, college: Towson, agency: Duran International). He played most recently at CB Clavijo in Spanish LEB Gold. In 31 games he recorded 8.6ppg, 4.8rpg, 1.0apg and 1.1spg last season. Among other achievements Adala Moto's team made it to the CAA Tournament Semifinals in 2017. He received also NABC All-District 10 2nd Team award in 2016 at his college time. Adala Moto represented Cameroon at the Afrobasket Championships last year. His stats at that event were 4 games: 15.0ppg, 7.0rpg, 2.0apg, FGP: 46.7%, 3PT: 30.0%, FT: 66.7%. Adala Moto graduated from Towson University in 2017 and it is his second season in pro basketball. The scouts decsribe him following way: Physically-developed forward who is very strong and powerful ... With his strength, has the ability to drive and get to the rim ... Outstanding defender ... Versatile offensive player with the range to step out and shoot it from beyond the arc ... Great footwork due to a soccer-playing background.